Cambridge (2006 population 120,371) is a city located in Southern Ontario on the Grand River and Speed River in the Region of Waterloo, Ontario, Canada. 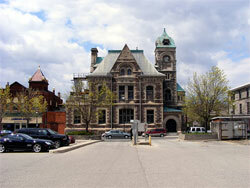 It is composed of the former city of Galt, town of Preston, and town of Hespeler, Ontario. Galt covers the largest portion of Cambridge, taking up the southern half of the city. Preston is located on the western side of the city while Hespeler is the most north-easterly section of Cambridge. Cambridge began as a composite city in 1973, when the three municipalities of Galt, Preston and Hespeler and the settlement of Blair were amalgamated into a single legal entity under a new name. (It was not so very new--Preston was once known as Cambridge Mills. )There was considerable resistance among the local population to this "shotgun marriage" arranged by the provincial government and a healthy sense of rivalry had always governed relations among the three communities. Even today, residents will tell the outside world that they call Cambridge home, they will often identify themselves to each other as citizens of Galt or Preston or Hespeler. Each unique centre has its own history that is well documented in the Cambridge City Archives. The first mayor of Cambridge was Claudette Millar, who at the time was one of the few female mayors and, at 35, the youngest mayor, in Canada. As Cambridge has developed and the open spaces between the original municipalities have been filled in, a fourth commercial core, entirely modern in its construction, has emerged. The Macdonald-Cartier Freeway (401) runs through its midst. On May 17, 1974 flooding on the Grand River was so intense it filled city streets with water to a depth of about four feet. Hundreds of businesses and homes were severely damaged. From Wikipedia, the free encyclopedia.